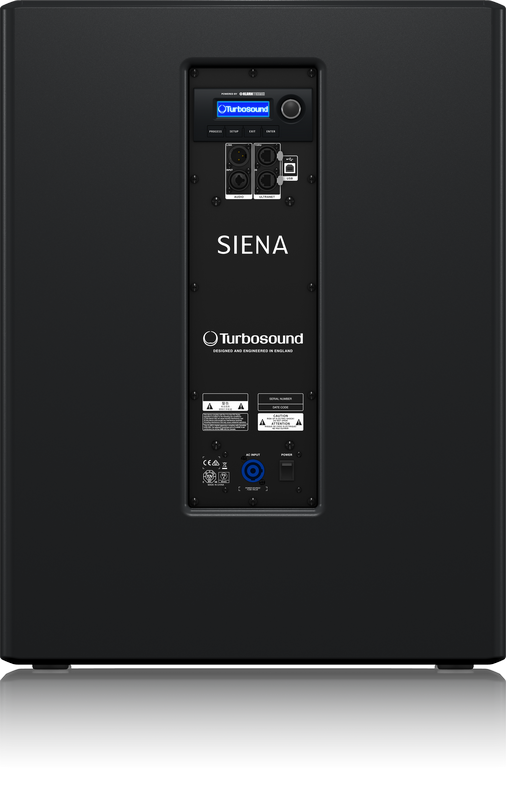 The Siena 3,000 Watt TSP118B-AN is a powered 18" front loaded, bass reflex subwoofer enclosure that is optimally tuned for extended low frequency response. Designed to work individually without a controller, the TSP118B-AN provides very high output FOH performance and is ideally suited for a wide range of music and live sound reinforcement applications. TURBOSOUND is recognised the world over for designing and building some of the most iconic loudspeakers and subwoofers. We take meticulous care and pride in maintaining that reputation by utilising only drivers designed specifically for each application – it’s what sets us apart from the competition. The TSP118B-AN features a powerful 18" low frequency driver that utilises a special inside/ outside wound voice coil for higher magnetic density, better heat dissipation, high power handling capacity, and improved efficiency. For its size and operating bandwidth, the TSP118B-AN delivers extremely high output that is virtually distortion-free – for world-class low frequency performance that will stand the test of time. Equipped with a very efficient and lightweight KLARK TEKNIK Class-D power amplifier, the TSP118B-AN provides an impressive 3,000 Watts of output power in a highly portable and lightweight package. Class-D amplification makes all the difference, offering the ultimate in energy efficiency and eliminating the need for heavy power supplies and large heat sinks. On the rear panel amplifier module, you will find a fully featured user interface consisting of an LCD display, with a single rotary encoder for intuitive access to level, EQ, and Feedback Control (FBI). A combination balanced XLR/jack input is provided, plus a balanced XLR output for connecting to powered satellite loudspeakers.